Too many people think graphic design is not a specialty, but something anyone can do, because the tools to make decent-looking Web pages, newsletters, books, and the like are readily available. But design isn’t putting stuff on a page. It’s about solving visual problems through an iterative process of decisionmaking, which may involve consultation, or may happen in private. If you can’t master that process, you can’t work in the field. Glenn Fleishman on Yahoo’s logo redesign. Weirdly formatted unreadable text? Check. Poorly designed machine with usability failures leading to poorly designed poster to cover same? Check. 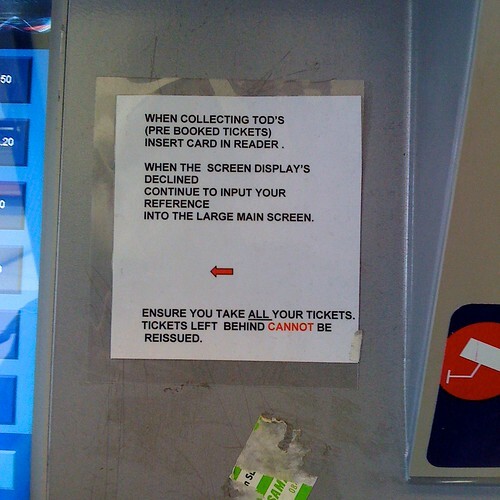 I don’t know what pisses me off more; that the process of collecting tickets is so badly designed it requires a sign like this to be stuck to the machine, or that the sign itself is so bloody awful.